a great number of photons were released by hundreds of billions of stars. Those photons traveled for 20.5 million years and the first solid thing they encountered was the primary mirror on my telescope. The primary mirror directed the photons to a secondary mirror, which directed them to a CCD sensor on my camera. The galaxy is named NGC 2903, and it is a barred spiral galaxy that is 20.5 million light years from Earth. 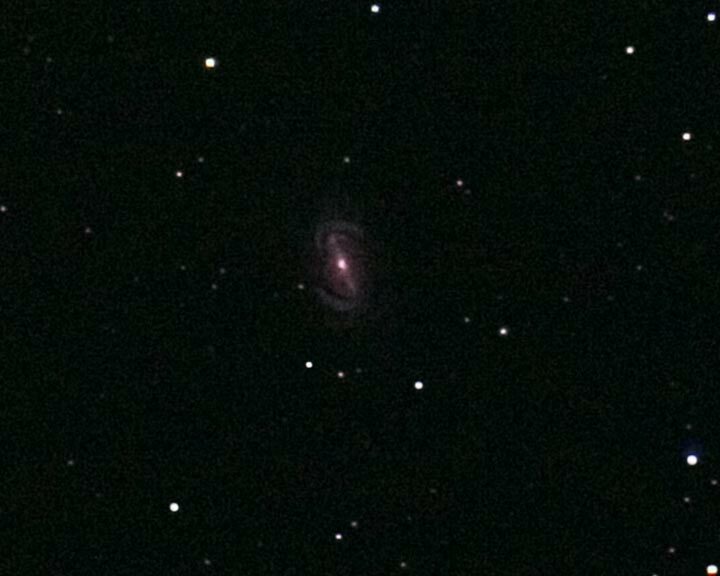 Here is another photo of this galaxy, along with a galaxy about which little is known. How can photons travel 20.5—or 150—million years when the Universe is only 6,000 years old? The Alnitak region of the constellation Orion, photographed on December 2, 2008. The bright star is Alnitak, which is plainly visible to the unaided eye on winter evenings as the left-most star in Orion’s belt. 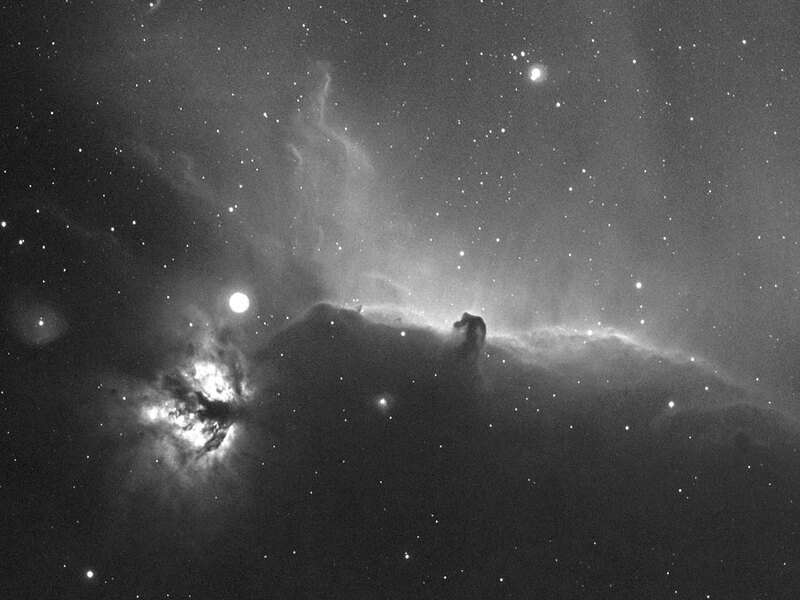 The famous Horsehead and the Flame Nebula are here, as well. The red nebula that delineates the Horsehead is known as Orion B, or NGC 2024. The blue nebula near bottom center is NGC 2023, the purplish nebula to the left of Alnitak is IC 432, and the dim blue nebula above IC 432 is IC 431. 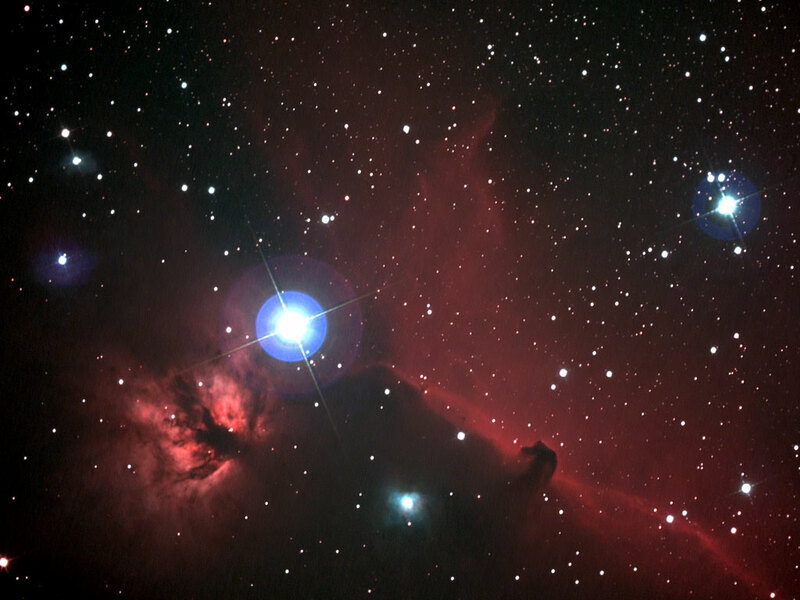 The Flame Nebula and the Horsehead are approximately 1,500 light years from Earth, and they are part of the same huge complex of nebulae that glow in and around Orion. The halos around the bright stars and the diffraction spikes are artifacts of the Takahashi Epsilon 180 reflecting telescope that I used to make this image. The camera was a Canon 40D modified by Hap Griffin. Other equipment included a Starfish guide camera on an 89 mm Questar Duplex and a RoboFocus for the Takahashi. The mount was an Astro-Physics 1200GTO. Nine 10-minute exposures. Made on a Mac. Read more about the Alnitak region and see the first image that I ever made with a CCD camera. I made this photo between August 31 and September 7, 2007. The largest mass is NGC 7000, The North American Nebula. It isn’t difficult to imagine the outline of North America in this nebula, especially Florida, the Gulf of Mexico, and Central America. On the right is IC 5067, The Pelican Nebula. His knobby head, dark eye, and bill are quite plain. The word nebula comes from Latin, where it means mist. In German, Nebel means fog. From the Latin word we derive nebulous, which means unclear, vague, or ill-defined. That's a very apt description of the appearance of a nebula in a telescope. Amateur astronomers often call them faint fuzzies because that's what they mostly look like through the eyepiece of a telescope—faint, indistinct patches of light. 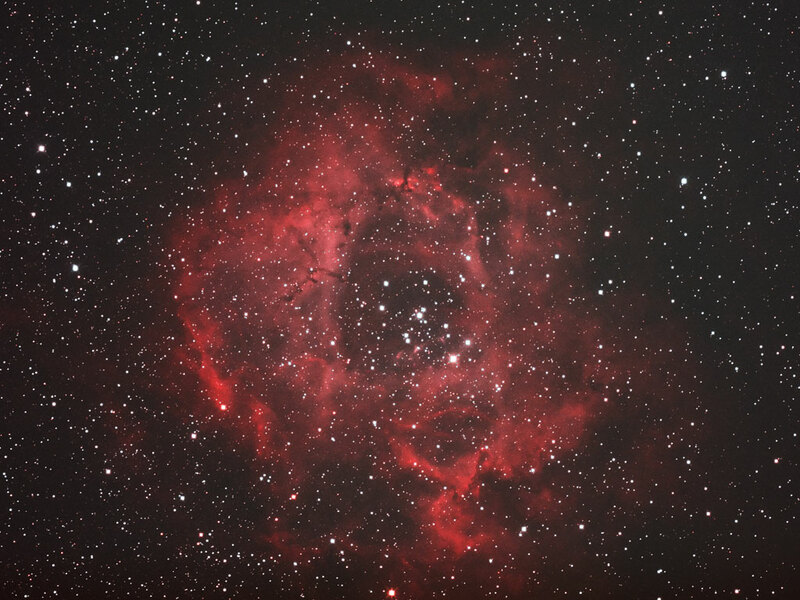 It takes a photograph to give some sense of the true appearance and extent of a nebula. The plural of nebula may be given as nebulae or nebulas. NGC 7000 consists of vast clouds of hydrogen gas and dust. The hydrogen is glowing because it is being bombarded by radiation from stars, many of which are unseen in this photo because they are blocked by the hydrogen and/or the dust. The radiation causes the hydrogen to emit photons. That makes NGC 7000 an emission nebula, i.e., one whose gas emits light due to bombardment by radiation from stars. Another kind of nebula is a reflection nebula. 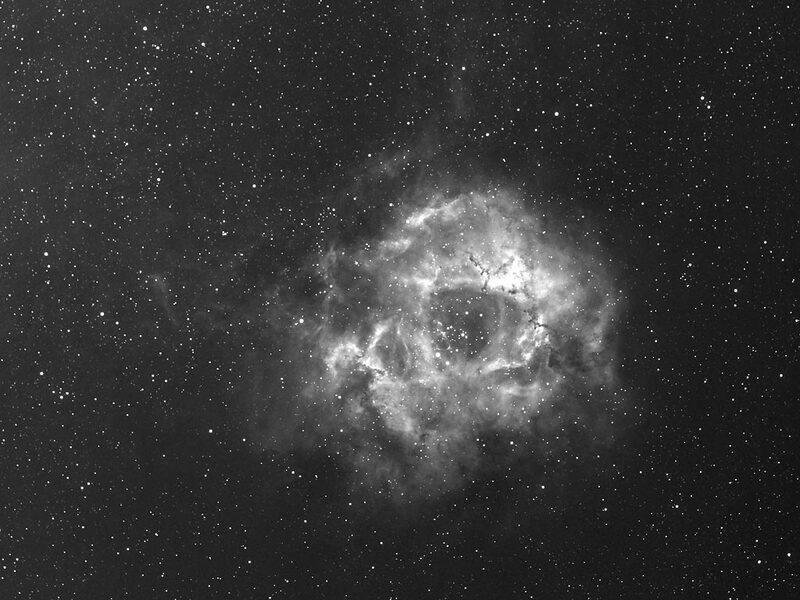 Much of the light in this photo is in a very narrow part of the red end of the spectrum known as the Hydrogen Alpha (Hα) band, and the sub-frames that make up this photo were taken through a Hydrogen Alpha (Hα) filter that transmits only a 4.5 nanometer-wide portion of the spectrum centered at 656.3 Ångströms. For the most part the dark areas are not black sky, but dark nebulæ, clouds of dust that obscure the light of the glowing hydrogen gas and the background stars in some areas. There are also at least three named star clusters in this photo. The most obvious is NGC 6997, which is a large, widely spaced open cluster situated due north of the “Florida” peninsula. NGC 7000 is about 65 light years across, while the entire nebula complex (which does not fit in this image) is 130 light years across. This nebula complex is believed to be 1,900 light years (LY) from Earth. That’s next door relative to the scale of the Milky Way Galaxy (100,000 LY across), not to mention the large scale of the Universe itself. Still, the photons that made this image traveled for 1,900 years without hitting anything until they encountered my telescope mirror. This picture is special to me because it is a First Light image, that is, the inaugural image from a new telescope. That telescope, a Takahashi Epsilon 180ED, and the SBIG STL-11000M camera that I used to make this picture, are shown on this page. I believe that this is also my first photo with in the light of Hydrogen Alpha. Update: I made a new Hα photograph of the NGC 7000 region on 24-25 September, 2010. Orion, the Hunter, is a winter constellation. It is perhaps the best-known constellation in the sky because it is positioned astride the Celestial Equator and it is visible from the entire populated Earth. Orion's asterisms—its star patterns—are distinctive. In addition to the Hunter's arms and legs there is his unmistakable belt of three bright stars, and below the belt is his sword. Take a look at the sword with your unaided eye. It appears to consist of three stars, but practically the entire sword is shown above. 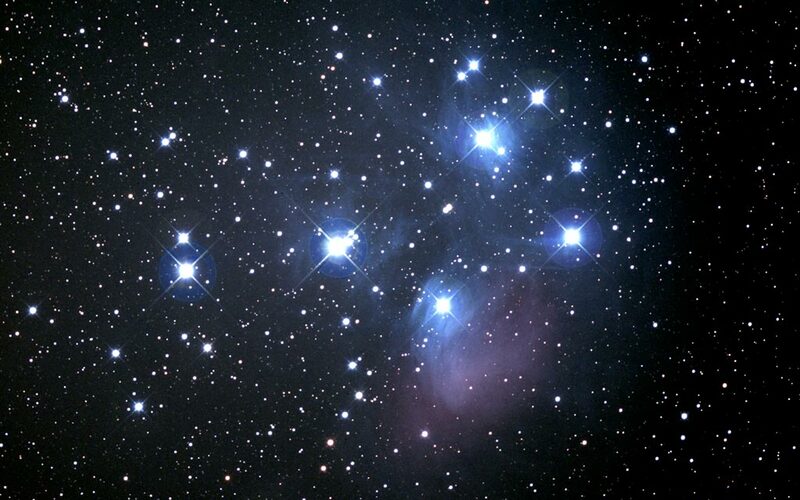 At the top is a cluster of stars in a patch of blue nebulosity called the Running-Man Nebula. That star cluster is the top "star" in the sword. Below it is M42, the Orion Nebula, the brightest part of which is lit by a cluster of very hot stars called the Trapezium that formed recently from the gas in the Nebula This cluster is the middle "star" in the sword. The brighter of the two stars at bottom is the bottom star in the sword. With simple binoculars you can see that the middle star is fuzzy and indistinct rather than a sharp point like other stars. In other words, you can see some of the M42 nebula through your binoculars. 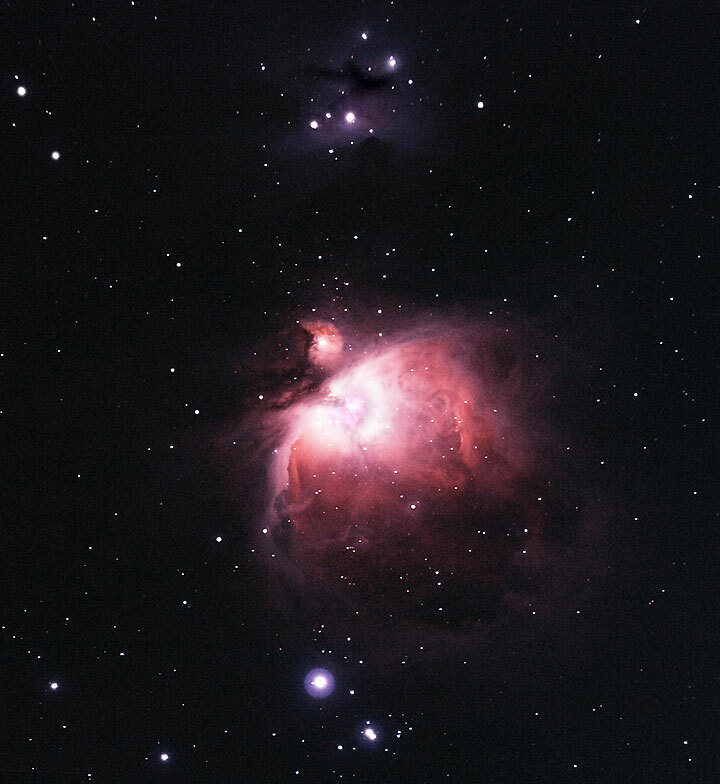 Seen through a small telescope the Orion Nebula appears pale green in color. M42 is about 1,600 LY from Earth. Practically the entire constellation of Orion is embedded in an enormous molecular cloud that emits visible radiation—a nebula, in other words, though it is much dimmer than M42. Rob Gendler, one of the best amateur astrophotographers in the world, was perhaps the first to record the extent of this cloud in this stunning photograph called the Orion Deep Field. Telescope: Tele Vue 76; camera: Canon 20D. January 28, 2006. 1,600 light years distant. The bright star is Alnitak, the left-most star in Orion’s Belt. winds act upon clouds of water vapor). The dynamics are virtually identical in each case. of different suns along the way. 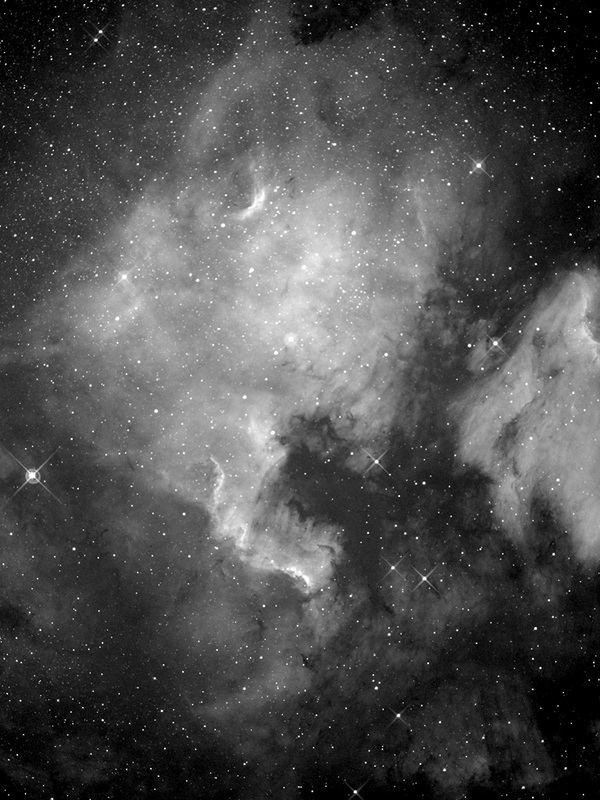 This is another Hydrogen Alpha image. It is comprised of six 10-minute exposures.